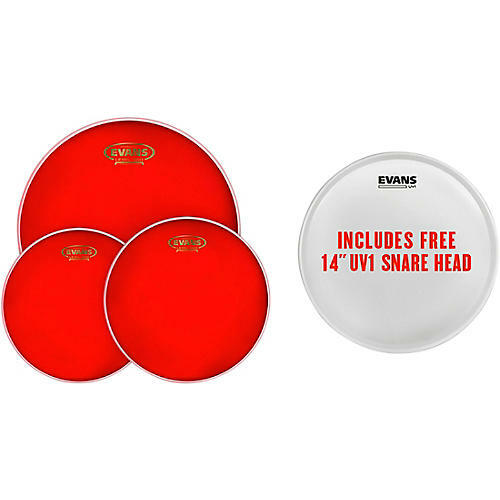 Evans™ Hydraulic™ Red series features a thin film of oil between two plies of 7mil film offering maximum durability, a fat, deep and short sound pioneered by early '70s rock and roll. Hydraulics are famously easy to tune, making them a perfect fix for troublesome drums and players with little tuning experience. Includes a Free 14 in. UV1 Coated Snare Head. The UV1 series is designed for the widest range of sonic possibilities while remaining the most durable single-ply drum head available. The patented UV-cured coating provides unmatched durability and consistency of texture, while the unique 10 mil film delivers exceptional strength and versatility for a full range of musical applications.